Whatever you are looking for, you’ll find it in our Guide! Find the Guide throughout the magazine with the title at the top of the pages. Some advertisers offer services year-round, so check the Guide even if you aren’t looking for a camp/program. Win Yowie chocolates with an animal prize inside at www.RIParentMag.com The Yowie company will hand out free candy at Roger Williams Park Zoo’s Spring Festival at Carousel Village on April 8. But there’s another way you can get Yowies for your kids (or yourself, we won’t tell) – visit our website, www.RIParentMag.com, to enter for your chance to win these treats! Your kids can also play games and learn about conservation and ecology at www.Yowieworld.com. Tag @riparentmag with #familytime on Instagram and we may share your pics! 6	A Note from the Publisher Introducing phase 2. 10	A Better Life Living offline. 12	Education Graduation rates by school. 15	News Briefs Recycle toys; pet fashion show. 16	Get Active Preparing for camp. www.RIParentMag.com to enter for your chance to win great prizes. And while you’re there, take a look at our latest calendar of events and directory of businesses and organizations for whatever you need. Find information about camps and programs throughout the magazine. For birthday parties and other events, see pages 19 and 21. 57 Rolfe Square, Box 10094 Cranston, Rhode Island 02910 (401) 337-9240 Founder and Publisher Susan Gale publisher@RIParentMag.com Art Director/Graphic Designer Rob Kenney artdirector@RIParentMag.com Copy Editor Sheila Flanagan editor@RIParentMag.com Business Manager Lisa Koulibaly sales@RIParentMag.com Sales and Marketing Manager Stephanie Bernaba (401) 337-9240 sales@RIParentMag.com On the cover: photo by Susan Gale Publisher photo taken by Keith Jochim. KeithJochimPhotography.com Rhode Island Parent Magazine is published monthly by Gale Force Communications. Unless specifically noted, no advertisers, products, or services are endorsed by the publisher. Editorial submissions welcome. ©2017 All rights reserved. Reproduction in whole or part without written permission is prohibited. hode Island’s public high school graduation rate has risen steadily from 70% in 2007 to 85% today. High school graduation rates are an important marker for both individual success and the state’s economy. Between 2011 and 2015 in Rhode Island, adults without a high school diploma were four times more likely to be unemployed as those with a bachelor’s degree. During the same period, the median earnings of adults without a high school diploma or equivalency was $23,247, compared to $31,196 for adults with a high school degree, and $51,769 for those with a bachelor’s degree. Rhode Island KIDS COUNT, a non-profit children’s policy and advocacy organization that provides legislative information, publications, resources, and news, released a report in March which looks at a variety of statistics about RI’s graduation rates and makes recommendations to improve them. (To see your public school’s graduation rate, go to page 12.) The results show overall improvement by schools but that disparities still remain. Of 56 high schools, 57% of them graduated 90% or more of their students in four years. In 2016, 79% of low-income students graduated in four years, compared to 93% of higher-income students. There were similar disparities among different racial and ethnic student subgroups and children with disabilities. According to the KIDS COUNT report, 92% of Asian students, 88% of white students, 81% of black students, 79% of Hispanic students, 78% of Native American students, and 63% percent of students with disabilities graduated in four years. “We can’t just look at overall graduation rates going up, we can’t miss students who are not seeing the same achievements,” said Stephanie Geller of KIDS COUNT. “There is increasing attention on middle school, on where kids fall off the track and issues of transition between middle and high schools.” Here is a brief summary of the recommendations made by KIDS COUNT. Visit www.riparentmag.com to read the full recommendations. Ensure that all children read proficiently by the end of third grade, focusing on school readiness, reducing absence, and increasing access to high-quality summer learning. Establish early warning systems to identify students at risk of dropping out and provide personalized interventions. Reduce chronic absence at all school levels by looking at why it is happening, rewarding good attendance, and incorporating families and the community in solutions. Improve school climate and disciplinary practices through behavior expectations, consistent consequences, and alternative disciplinary approaches. Help students better transition from middle school to high school through individualized support and preparation, accelerated learning programs, and school collaborations. Focus on closing achievement gaps between low-income and higher-income students and white and minority students by monitoring data on them and offering support. Continue providing dedicated funding for English Language Learner instruction in the education funding formula. Provide multiple pathways to graduation for all students who need them, including credit recovery programs, online learning, and dual enrollment programs (college courses). Offer a rigorous and engaging curriculum aligned with standards and tied to college, careers, vocational opportunities, and hands-on, individualized learning opportunities. Ensure equitable access to advanced coursework through easy-to-use information about programs available. Ensure that all middle and high school students have robust Individual Learning Plans (ILPs), which are regularly reviewed and updated. Offer opportunities for students to provide input and participate in decision-making that affects their individual learning as well as their larger school community. These programs include classes on Saturdays, evenings, and in the summer. “Teachers came in on Saturdays, we just had to ask them,” he said. Graduations also began to happen in August and December at school board meetings to provide for students who took a bit longer or came back after dropping out. Additionally, the school works with Rhode Island College so that students can receive conditional acceptances in their junior year. “That changed the outlook for a lot of students,” Capellan said.  KIDS COUNT is the source of statistics used in this article. Susan Gale is Founder and Publisher of Rhode Island Parent Magazine. To graduate in Rhode Island, the classes of 2021 and later must: Demonstrate proficiency by meeting high school content standards in English language arts, math, science, social studies, the arts, and technology. Complete at least 20 courses, including four English language arts courses, four math courses, three science courses, three social studies courses, and six other courses. Complete at least one performance-based assessment, demonstrating applied learning skills and proficiency in one or more content areas. Starting with the class of 2021, graduates can earn the following designations from the Council on Elementary and Secondary Education: Commissioner's Seal: Proficiency in English language arts and math. Seal of Biliteracy: Proficiency in English and one or more other world language(s). Pathway Endorsements: Deep learning in a chosen area of interest and preparedness for employment or further study. Source: Rhode Island Department of Education. Share your family memories with us! cheap. (Try Savers in North Attleboro – they have a great selection!) Choose from kids’ picks (soundtracks, nursery rhymes, or silly songs), world music (creating a platform for discussion), or family favorites. Make it a habit. My kids now come home from school each day and beg us to play records. Take up a family hobby. This winter, my family got organized. In the spring, we’ll plant our first vegetable garden. Mama may Instagram a few plants along the way, but we’ll all be working together this summer to feed our family. Play games. In our house, we’ve recently gotten into board games and puzzles. There are five of us, so we’ve found games we can all play together. Cook together. Instead of going out to get your faves, try making them at home. Want corn dogs? Find a recipe online and involve the kids. Feel like sushi? Grab the tools you need and let your family try their hands. Not only will you be working together, you’ll also be teaching your children valuable cooking skills. Pro Tip: Try thrift or consignment stores for extra utensils and appliances like fryers, bread machines, and electric griddles that can be placed in kid-friendly locations. Get crafty. There are many places that will allow entire families to craft together. Check out Michael’s for very affordable family art classes, and paint and pottery studios where all family members can participate. Try something new. Try ziplining, bowling, family go-karts, skating, travel, or biking – an activity in which everyone can participate. The key is keeping everyone active, engaged, and focused on a common goal. Now get out there and make some family memories – and then share them with us on Instagram!  Stephanie Bernaba, of Richmond, is Sales and Marketing Manager for Rhode Island Parent Magazine. She is also an independent journalist specializing in life in the digital age and entertainment, writing at several sites around the ‘net. Check out her recent work and digital portfolio at www.whiteorchidmedia.com. Send us photos of your family time together! Tag @riparentmag with #familytime on Instagram and we may share your pics! Special deal for camps advertising in May and June: Act now and save $114! 50 Rolfe Square, Cranston 401-490-9475 www.artists-exchange.org Fantastic day camps for the creative mind! Art, Theater, Rock ‘N’ Roll, and Ceramics. Ages 5–15. Camps start June 19th and run through August 25th. Monday–Friday, 9 am–3 pm, before and after care available. See ad, page 7. Kingston’s Camp on Larkin’s Pond Peace Dale 401-783-8620 www.kingstonscamp.com See ad page 11. 1589 Putnam Pike, Chepachet 401-568-3580 www.motherofhopecamp.com See ad, page 11. India Point Park, Providence 401-454-7245 www.communityboating.com Two-week youth sailing camps offered June–Aug. Mon–Fri 9am–3:30 pm. NEW one-week Save The Bay Camp. Two age groups, 8–11 years old and 12–16 years old. Waterfront “Sailabration” skippered sailing events, room/deck rentals, youth afterschool programs, and evening or weekend adult lessons, recreational sailing, and NEW kayaking also available. See ad, page 11. 2 College Street, Providence (401) 454-6200 CE.RISD.EDU Summer is busy at RISD, where kids shape their creativity and imagination, and teens develop their personal style as artists and designers. Camps and classes for kids and teens ages 6–17. See ad, page 17. 41 Comstock Pkwy, Cranston 70 Industrial Rd, Cumberland 401-228-8946 www.dreambiggym.com See ad, page 7. Glocester, West Kingston, Newport, Swansea, MA 401-331-4500/1-800-331-0149 www.gssne.org Get ready for a summer filled with activities like archery, hiking, sailing, reaching new heights on the challenge course, swimming, and don't forget campfires & s'mores! Financial aid available. Visit gssne.org to register NOW! See ad, page 17. 401 Elmgrove Ave, Providence, RI 401-421-4111 www.jewishallianceri.org June 26–August 25, Mon–Fri 9am–4pm. For children ages 3–15. Welcoming all faiths and backgrounds. Enjoy a variety of activities with themes such as mystery, construction, Olympics and carnival. Daily schedules filled with sports, swim lessons, art, cooking, science, drama, field trips, and more. Lunch and snacks included. Early arrival and extended day options; half-day options for 3–4 year olds; sibling and early bird discounts; payment plan options; counselor-intraining opportunities for teens. 100 Higginson Ave, Lincoln, (401) 727-1704 1174 Kingstown Rd, Peace Dale, (401) 789-SPOT www.rockspotclimbing.com See ad, page 7. 170 Jefferson Blvd, Warwick 401-463-5565 www.teamworkswarwick.com See ad, back cover. Multiple locations 401-334-0100 www.childrensworkshop.com A fun, active, and educational summer experience. Bi-weekly themes cover every interest from sports to discovery science to travel. Field trips, special guests, arts and crafts, swimming, dancing, singing - you name it, we do it! Also, special events for both children and families. See ad, page 7. Barrington; Cranston; Warwick; Peace Dale; Seekonk, MA. See website for telephone numbers www.ymcagreaterprovidence.org See ad, inside cover. Save the date: RI Pet Fashion Show May 12 Pets in the latest fashions? What could be more fun? And it’s all for a good cause. The RI Pet Fashion Show will take place from 7:30–9:30 pm on May 12 at Bow Chicka Wow Town, 27 Meadow Street, Warwick. Funds raised will be used by non-profit PetsEmpower towards helping 20 domestic violence victims find short-term pet fostering this year in Rhode Island. Proceeds will provide veterinary care, transport, and food for pets while they are in fostering until they can be reunited with their owners. Fear for their pet’s safety, or being required to give them up, keeps some domestic violence victims from leaving their situation because shelters cannot take pets. Emily Volz of Channel 10 is the MC for the show. Tickets are $20 until May 4, $25 from May 5–12, and $30 at the door. Tickets are $10 for students. Includes prizes for Pet Fashion Show winners, a 50/50 raffle, live entertainment, and food. Visit www.petsempower.org for information. Apps for traveling with kids With Spring Break upon us and summer approaching, there may be traveling with children in your future. Below is a list of apps, compiled by TravelOn Hand Soap Sheets, which you can download to keep your children entertained and yourself sane. (Editor’s note: This is for information purposes. RI Parent Magazine does not test or endorse products.) Roadtrip Bingo: This game allows kids to check off things they spot while on a trip. Similar to the old license plate spotting game, this app also includes options for airplane travel. (iOS + Android – free) FamilyTime Dashboard: Kids have a tendency to wander off. Better to be safe than sorry, and download FamilyTime Dashboard. Prior to leaving the house, install the app on your mobile device and their phones or tablets. The app safely monitors your child’s location, as well as any Internet or smartphone activity. (iOS + Android – free) GetBeen: Use GetBeen to see your friend’s restaurant, hotel, and amusement kid-friendly recommendations during your travels. Explore what’s nearby while sharing your experiences. No more frantic Facebook statuses asking for restaurant recommendations in the middle of nowhere! With GetBeen you have your friends’ opinions at your fingertips. (iOS – free) HERE WeGo: This app provides detailed turn-by-turn directions for more than 100 different countries, which you can download and access offline, making it a great app to help avoid data fees. HERE WeGo also offers directions for various forms of transportation, including car, bike, or public transportation and updates prices, traffic conditions, and where to park, for any drive. (iOS + Android – free) TravelOn Hand Soap Sheets are paper-thin, pocket-sized biodegradable soap sheets which dissolve almost instantly in water, giving you a handful of cleansing suds anywhere. hy not enjoy the ending of school with your kids by preparing for summer camp and programs now? We hope you’ve taken a look at the camps and summer programs spread throughout the magazine to find what will interest your children. We offer a wide variety of types of camps and programs and add new ones every month through July, so keep checking. 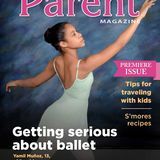 If you need quick access to the list, you can also visit www.RIParentMag.com for up-to-date listings and ads. Camps and programs are an important part of summer because they reinforce the learning your children do all year. Fun is combined with education – helping kids to improve in areas such as self-confidence, self-esteem, listening, and social and friend-making skills. More than 14 million children and adults attend camp each year, according to the American Camp Association (ACA), a nationwide organization that accredits children’s camps. The ACA reports that more than 14,000 camps exist in the U.S., with 8,400 overnight camps and 5,600 day camps. Camps employ more than 1.5M people, with nearly 20% of those staff being from other countries. Jack Conway of Active Learning Services, which runs chess camps and video game creation camps in Rhode Island, urges parents to do their homework when it comes to choosing a camp. “It’s important that they look for programs that are going to be challenging and fun for their children,” he said. “Make sure the camp is highly rated, at a good location, and that the company they are entrusting their kids to is property licensed.” It’s also a good idea to start talking about camp and summer programs now to prepare your children, especially if they are attending overnight camp for the first time. Don’t promise to come rescue your child from camp if they are homesick or otherwise unhappy because it can sabotage their ability to succeed. But rest assured, camp counselors are prepared to help your children with any issues. To improve their chance for success, add these items to your Camp Bag or Bucket – family photos and items that allow your kids to write home during camp.  Susan Gale is Founder and Publisher of Rhode Island Parent Magazine. April 2017 Always check with event sponsors for updated information. Visit the calendar at www.RIParentMag.com for the latest information and the best way to submit calendar items. 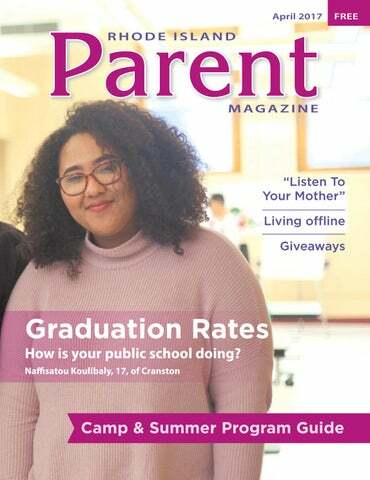 Or email to editor@RIParentMag.com. Free event on April 4 with the National Ambassador for Young People’s Literature For kids from 8 to 80, Books on the Square and Moses Brown School are bringing Gene Luen Yang, author of Secret Coders and American Born Chinese, to Providence. Yang was named the National Ambassador for Young People’s Literature by the Library of Congress, Children’s Book Council, and Every Child A Reader. Books will be available for purchase at the event at 4 pm on Tuesday, April 4, at the Woodman Family Center at Moses Brown School, 250 Lloyd Avenue, Providence. Animals. Providence Children’s Museum. 100 South Street, Providence. $9/person; free/children under 12 months. www.childrenmuseum.org April 17: Meet an awesome assortment of live animals. Children have close encounters with dozens of furry friends, slithering snakes, and other incredible creatures, and learn fascinating facts about them from animal expert Dave Marchetti of Animal Experiences. Shows at 11:30 am, 1 pm, and 2:30 pm; recommended for ages 3 and up. April 18: Families learn about majestic birds of prey with licensed raptor rehabilitator Julie Collier. Meet a red-tailed hawk, a falcon, a tiny owl, and other magnificent raptors. Shows at 10 am, 11 am, 1 pm, and 2 pm; recommended for ages 4 and up. Roger Williams Park Zoo. Activities, demonstrations, and performances daily. Animal encounters, animal ambassadors, entertainment, games, and music, as well as special “Keeper Talks” to learn more about exhibit animals in each featured region. 10 am–5 pm. Roger Williams Park Zoo, 1000 Elmwood Avenue, Providence. Free with Zoo admission. April 21: Audubon Party for the Peregrines. Live and silent auctions, hors d’oeuvres, and cocktails. Audubon’s live owls, hawks, and a kestrel will be presented and the Providence Peregrine Webcam featured. Proceeds support the Audubon Society of Rhode Island raptor care. 7–9:30 pm. Squantum Club, 1 Squantum Road, East Providence. $80–$150/admission. Tools of the Treasures Exhibit. A unique exhibit of locally made jewelry and silverware from 1860–1960 displayed with the tools that made them. Examples from Gorham, Tiffany, Walter Lampl, Monet, and more. 10 am–3 pm. Providence Jewelry Museum, 1 Spectacle Street, Cranston. $10/admission. the kiddos for a unique craft each week, story time, and open play gym. 10–11:30 am. Dream Big Academy, 41 Comstock Parkway, Cranston. $12. Weekends April 1/Saturday Free Family Fun Days at Audubon Environmental Education Center. Open free to the public the first Saturday of every month. Crafts, nature stories, animal discoveries, hikes, and more. No need to register. 9 am–5 pm. 1401 Hope Street, Bristol. Free. www.asri.org Rhode Island Home Show 2017. Large home and property improvement trade show. Attend seminars, cooking demonstrations, and send your children to activities for kids. 10 am–9 pm on Saturday; 10 am–5 pm on Sunday. RI Convention Center, 1 Sabin Street, Providence. $10/adults; $8/seniors; free/ children under 15. Woodcock and its exuberant mating flights. Then venture outdoors to watch and listen for the mating flights and songs. Wear sturdy shoes, dress warmly, and bring a bright flashlight. For ages 9 and older. 6–9 pm. Powder Mill Ledges Refuge, 12 Sanderson Road, Smithfield. $30. Rhode Island Home Show 2017. 10 am–5 pm. See April 1. Sparky’s Puppets: Tricksters and Noodleheads. Sparky’s Puppets dramatize favorite children’s stories with colorful hand puppets, lively humor and plenty of audience participation. 11 am–noon. Artists’ Exchange, 50 Rolfe Square, Cranston. Suggested $5 donation. Stick Structures. Families build huge three-dimensional structures from wooden dowels and rubber bands. Create structures that are large enough to climb inside and construct a giant cube that stands up on its own. 10 am–3 pm. Providence Children’s Museum. 100 South Street, Providence. $9/person; free/children under 12 months. www.childrenmuseum.org Wild Art at Roger Williams Park Zoo. Artist and educator Eric Fulford. Visit the focus animal to observe the animals' unique adaptations and form before returning to the classroom to create works of art. 10:30 am-noon. Roger Williams Park Zoo, 1000 Elmwood Avenue, Providence. $20/members; $30/ non–members. Includes materials. www.rwpzoo.org Eleventh Annual Casey Farm Easter Egg Hunt. Collect plastic eggs for prizes. Explore the farm, play games, have light refreshments, and make an Easter craft. 10:30–11:30 am. Historic New England's Casey Farm, 2325 Boston Neck Road, Saunderstown. Pre-registration required. Rain or shine. Free/Historic New England member children; $10/non-member children. First Baptist Church of Narragansett. 6:15 am. The Towers, 35 Ocean Road, Narragansett. Free. Del's Lemonade will be available. 10 am–	5 pm. Herreshoff Marine Museum, One Burnside Street, Bristol. Free. Eco Explorers. In celebration of Earth Day, try a variety of activities exploring conservation. Play a recyclable sorting game, stamp with tree pieces to create designs and patterns, craft with recycled materials, and more. 10 am–3 pm. Providence Children’s Museum. 100 South Street, Providence. $9/person; free/children under 12 months. www. childrenmuseum.org Sesame Street Live “Make a New Friend.” Elmo, Grover, Abby Cadabby, and their Sesame Street friends welcome Chamki, Grover’s friend from India, to Sesame Street. April 21-23. Providence Performing Arts Center, 220 Weybosset Street, Providence. $21-$71/tickets. The Growing Season Begins. Join Casey Farm's experts as they lead you through the best techniques for growing early crops in this hands-on workshop. Take home your plants. Planting materials included with registration, but bring own gardening gloves. 1–3 pm. Historic New England’s Casey Farm, 2325 Boston Neck Road, Saunderstown. $6/members; $10/non-members. April 23/Sunday Where the Wild Things Are Character Appearance. From “Where the Wild Things Are.” Get pictures taken with Wild Thing. 1–1:30 pm. Barnes & Noble, 1350 Bald Hill Road, Warwick. Free. Eco Explorers. See April 22. April 29/Saturday Opening Day at the Herreshoff Marine Museum. Enjoy guided tours, family activities, arts and crafts, games, tournaments, prizes, spring fun, and more! Money Smart Week Activities for Kids at Weaver Library. Drop-in to the Children’s Room to have some fun while helping your kids learn about money. Kids can use a cash register to check out shoppers at our “library market,” match coins to $ amounts, and more. 9–5 pm. East Providence Public Library. 41 Grove Avenue, East Providence. Free. Graduation rates: How is your Rhode Island public school doing? Camp & Summer Program Guide. Yowie chocolate giveaway!